iWant’s original show “IKR (I Know Right?! )” is becoming the newest go-to entertainment online source with its hosts and showbiz insiders MOR 101.9 DJ Jhai Ho, TV Patrol Star Patroller MJ Felipe, and online sweetheart and television headwriter Darla Sauler coming together every Friday night to discuss and confirm the hottest entertainment news in the country. After their trending episode last week with guests Donny Pangilinan and Kisses Delavin, Jhai Ho, MJ, and Darla will invite more Kapamilya stars to join the discussion and answer the most hard-hitting questions about them. 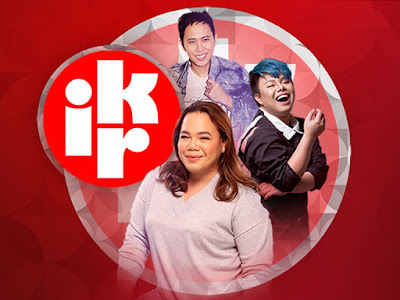 “IKR” also features segments such as “Emoji Reacts” where hosts show their emotions regarding an issue by flashing emojis, and “MOTD” or “Mema of the Day” to share their thoughts on the hottest topics. The hour-long regular livestreaming of “IKR” is every Friday, 9PM on iWant for free. The new iWant, ABS-CBN’s new streaming service, is already downloadable for free on iOS and Android today (November 15) ahead of its official launch on Saturday (November 17). Those who already have the iWant TV app on their devices simply need to update to the new version. iWant also gives netizens a special treat by streaming Maymay Entrata and Kisses Delavin‘s “Nura at Velma” episode from the original anthology series “Alamat ng Ano” today. The episode hilariously depicts the face-off between two rival actresses as they fight each other to become the leading lady of a foreign leading man.